Now through the end of May*, Close To My Heart’s amazing My LegacyTM albums are on sale for 25% off through our #AlltheAlbums special! That is a savings of over $8.50 per album! Choose from a gorgeous variety of colors and patterns in both post-bound and D-ring styles. But this offer is only available while supplies last, so place your order early to make sure you get the styles and colors you love. They’re built to last and going fast—order yours today! Order one album and get a free Seasonal Expressions 2 catalog. 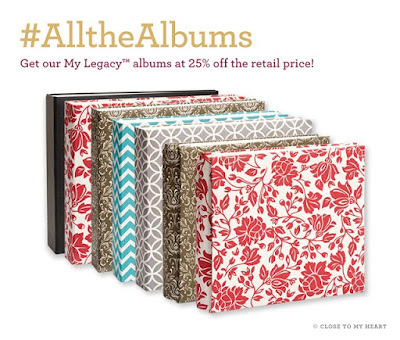 Order two albums and you will also qualify for the May Stamp of the Month for just $5. Order three albums and you will also get a free Happy Times (National Scrapbooking month ) paper packet - while supplies last. Click on the links above to see the stamp of the month and the paper packet offered.